By selling fireworks to raise funds, are local firefighters' associations tempting fate? How's this for irony: The Grover Beach Firefighters association and the Oceano CSD's volunteer firefighters are selling fireworks to raise money. It's better than the old one about the fireman's house burning down, yet fireworks sales have local nonprofits, like the firefighters association, clamoring to rake in some much-needed dough this Fourth of July, even if it may end up, well, backfiring. If business is good, the Grover Beach Assembly of God, Oak Park Christian Church, the Grover Beach Chamber of Commerce, and the Grover Beach police and firefighters' associations could pull in $20,000-$40,000 this year. Not bad for a week's work. And that's not including all the nonprofit groups selling fireworks in San Miguel, Templeton, Arroyo Grande, and Oceano - the only other SLO County communities that allow the sale of Safe and Sane fireworks. THE BOMBS BURSTING IN AIR CDF: Investigator Mike Cole holds a batch of fireworks that was recently confiscated. 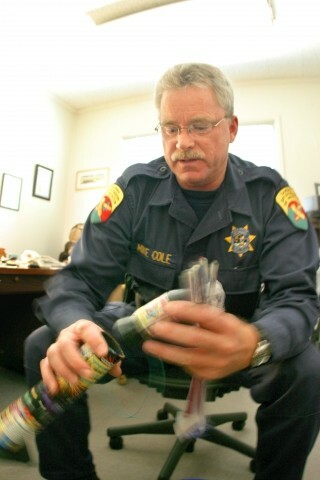 Cole calls the thousands of illegal fireworks in the hands of Californians â€œignition sources.â€? #The money raised during the sales represents a significant chunk of change for these nonprofits, chosen by lottery just for the privilege of setting up a booth. In Grover Beach, for example, the city clerk oversees the lottery. This year they had eight nonprofits enter the lottery. The city recently created a municipal code that guarantees the Chamber of Commerce and the police and firefighters' association two of the spots, leaving two additional - and highly coveted - spots up for grabs. It's not easy to find ways to raise so much money so effortlessly, said Deborah Love of the Grover Beach Chamber of Commerce. Love recognized that some people may not like the idea of selling fireworks to raise funds, but she said the fireworks companies, such as Phantom Fireworks, make it ridiculously easy. "They're amazing what they'll do to help you," Love said. "They provide the booth. The put it up, they maintain it. They provide the fire extinguisher. They work with the local city and fire department." Of course the fireworks companies have a financial interest in being helpful, but Love added the companies will process all the required permits and paperwork for the nonprofits, and cover the cost of liability insurance as well. This means the city, the owner of the property where the fireworks are being sold, and the nonprofit all receive coverage. After the Fourth, the Grover Beach Chamber of Commerce will split the net profit 50-50 with the fireworks companies. If there are any fireworks left over from the sale, the company will remove them along with the booth. Each of the five cities in the county that allow the sale of Safe and Sane fireworks has different rules regarding the allowed number of sellers and when and where one can legally light a Safe and Sane firework. Each city does prohibit the transfer of Safe and Sane fireworks to other communities. However, that hasn't stopped some from wondering why some communities should sell fireworks in a fire-prone environment when other communities and firefighting agencies are actively trying to limit the risk of fire. "Myself and my boss are on the record as being against the sale and discharge of fireworks," said Templeton Fire Chief Greg O'Sullivan. "Allowing legal fireworks makes it much more difficult to enforce the illegal because people have a hard time understanding the difference." Safe and Sane fireworks are legal only when purchased in Grover Beach, Oceano, San Miguel, Templeton, and Arroyo Grande and discharged on private property in those cities. The definition of a Safe and Sane firework is a little ambiguous. According to the state fire marshal web site, "Safe and Sane" fireworks means simply any fireworks that do not fall within the definition of "dangerous fireworks" or "exempt fireworks." Templeton CSD President John Gannon described Safe and Sane fireworks like this: "From what I've been told, if you ever see any of them, they're small little sparklers. On a regular two-car-garage driveway - no [Safe and Sane] firework would ever go beyond the bounds of that. They're just small, miniature little fireworks." But if you're looking for more confirmation, legal Safe and Sane fireworks have an official state fire marshal seal of approval. A recent state fire marshal press release explains, "If it goes up in the air or explodes, it's dangerous and illegal." The same press release also discusses the sale of illegal fireworks, noting that "illegal fireworks are prohibited in every community throughout our great state; they are responsible for almost all the fireworks-caused fires and injuries each year." Aside from the obvious irony of a firefighter selling fireworks - and Grover Beach and Oceano are not alone on this - there still are questions to be asked, such as if fireworks have the potential to start a fire, then why are any fireworks allowed at all? Chief O'Sullivan thinks there are two factors at play. One is the obvious enjoyment and great sense of patriotism that comes with lighting something, hopefully with loud report, on fire. The other is a bit more controversial, and of course political. Because the groups selling the fireworks are nonprofits, it's likely that various city officials are hesitant to anger local constituents by prohibiting the sale of fireworks. Also, as Gannon points out, that in "today's times of cutbacks on everything, some of these groups and organizations would fold or go under if they didn't have a way of fund-raising." And although the nonprofits and the city leaders may be tempting fate by allowing fireworks in such a dry climate, Gannon said that the money generated is crucial to the community. "The groups in Templeton that go ahead and sell the fireworks take that money and go help the youth groups and other activities for the kids in Templeton. So the money is sort of turned around and put back into the community." Charity benefits aside, Joe Costello, vice-chair for the Arroyo Grande City Council, said the risks posed by Safe and Sane fireworks have proven to be pretty small. Costello, who consulted A.G.'s fire chief, said he can't recall there ever having been a major incident in Arroyo Grande. "So far the system seems to be working okay," he said. Costello said that during the week that fireworks are allowed, the city increases patrols. "I've never had anyone express dissatisfaction or a problem with it... I've never had anyone from the neighboring communities complain." Alan Castillo of the Grover Beach Firefighters' Association said the fireworks sale was "one of the biggest" ways the group raises money. He acknowledged that some don't like the idea of selling fireworks, but said, "We've had them for a long time and haven't had any injuries. So it's all good for right now." Castillo stressed the importance of proper use, comparing lighting fireworks to using a band saw or gun. They can do damage, but, "if you use it correctly you won't get hurt." It's pretty easy to tell if the firework in your hand is "Safe and Sane" or dangerous, aka illegal. Safe and Sane fireworks have a state fire marshal seal, that's the simple answer. But the law about where and when to use fireworks is easily misinterpreted. Fireworks are only allowed in the communities they were purchased in, and only for a short period of time. According to the California Department of Forestry and Fire Protection's (CDF) Mike Cole, no fireworks of any kind are allowed on county land or at state beaches. But some tourists might be easily confused when buying Safe and Sane fireworks from fire departments near the beach. As a result, rangers at places like the Oceano dunes are busy busting both aware and unaware illegal-fireworks users. Rangers there fill a Dumpster every year with the contraband fireworks. Bottle rockets may be the most prolific fire starters, said Cole. The small aerial fireworks are easily launched by hand and from car windows. But other fireworks he called especially dangerous were "mortars"; flaming balls launched from a cardboard tube. If tipped over, the tube can easily project the flaming discharge into combustible material or onto a person. Illegal fireworks find their way into the state numerous ways. Some come from vacationers bringing them back from places like Nevada, Washington, or Mexico. But some are purchased in large quantities for the specific purpose of selling them illegally in California. CDF investigators recently arrested one man from Grover Beach in possession of 3,000 pounds of fireworks. He had a rental truck filled with fireworks and had just come from Nevada. The first time he was busted by CDF investigators, they raided his home and found 1,100 pounds of fireworks in his garage. The case is still open, but Mike Cole of CDF was confident that a judge would not go easy on the perp and that the man would be made to pay for the disposal of the fireworks. Disposal costs $5 a pound because, due to EPA regulations, the fireworks have to be shipped to Louisiana to be destroyed. Cole likened catching firework traffickers to going fishing - you're just not going to be able to catch them all, he said. But, as he pointed out, a 1,000-acre fire can cost about $1 million to fight. If you can spend a fraction of that removing illegal fireworks - ignition sources, as Cole calls them - from the hands of Californians, then not only have you drastically cut down the potential for fires, but you've saved money.